OK, there may be more than one, but for my money this is it. When making a major technology or security solution purchase, information technology decision-makers (ITDMs) download an average of nine content assets throughout the buying cycle, according to a report by IDG. Early in the purchase process, when determining business need and technical requirements, ITDMs rank content such as feature articles, technology news stories, how-to articles, and whitepapers as most important. 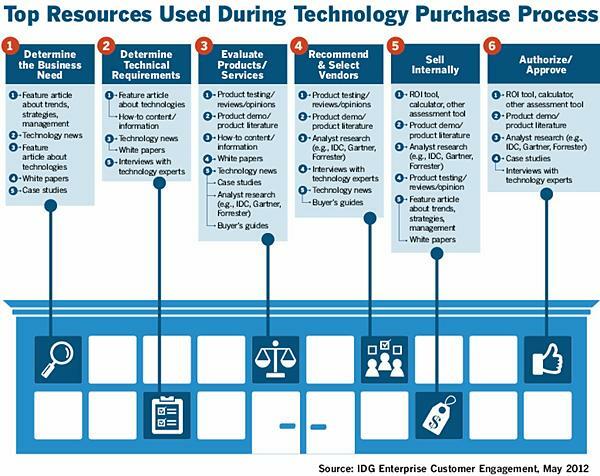 Midway through the process, when ITDMs are evaluating products and selecting vendors, content such as reviews/recommendations and third-party research (e.g., IDC, Gartner) plays a more important role. In the latter part of the buying cycle, when ITDMs are focusing on getting internal buy-in and final approval, content such as assessment tools (e.g., ROI calculators), product demos, and demo literature becomes more important.